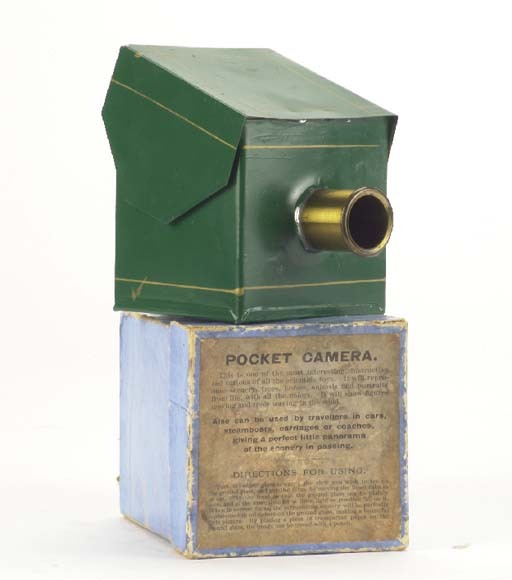 pocket model, the green-painted tinplate body with gilt line decoration, ground-glass screen and a brass-bound focusing lens, in maker's box with instruction label. The label reads: 'Pocket Camera. This is one of the most interesting, instructive and curious of all scientific toys. It will reproduce scenes, trees, horses, animals and portraits from life, with all the colors. It will show figures moving and trees waving in the wind. Also can be used by travellers in cars, steamboats, carriages or coaches, giving a perfect little panorama of the scenery in passing'.